Going to study in Denmark? Here is ultimate guide to unemployment insurance in Denmark for foreign students – everything you need to know. There are numerous laws and legal decisions originating from the Danish parliament and the European Union (EU) that govern how the Danish unemployment insurance system affects foreign students. It can be difficult for foreign students to navigate these regulations. This guide has been prepared to present a clear picture of the entire unemployment insurance system for foreign students in Denmark. The guide is divided into three parts. What will happen when the United Kingdom exits the EU? Citizens of countries in the EU/EEA and Switzerland must apply for an EU residence document when they stay in Denmark for more than three months. This is the case for both employees and students. If you are a citizen of one of the Nordic countries (Sweden, Norway, Finland, Iceland, Greenland, Åland or the Faroe Islands), you do not have to apply for an EU residence document. After receiving your EU residence document, you can go to the citizen service centre in your local municipality to get a NemID, register your address, apply for a health insurance card and apply for a Danish social security number. It is necessary to complete many of these steps before progressing with the actions explained in the rest of this guide. In Denmark, it is your own responsibility to acquire insurance against unemployment. Unlike other social benefits in the country, you are not automatically protected. You can insure yourself against unemployment by becoming a member of an unemployment insurance fund. There are 24 unemployment insurance funds in Denmark. These are called “a-kasser” in Danish. The unemployment insurance fund you choose has no impact on your rights. All unemployment insurance funds must follow the same laws, which are put in place by the Danish parliament and the EU. As such, the rules explained in this guide apply to all unemployment insurance funds in Denmark. However, you should keep in mind that the services provided by unemployment insurance funds may vary, and some unemployment insurance funds only accept members within a certain profession. You must be enrolled in Denmark for the whole of your education in order to qualify for unemployment benefits. The rules explained in this guide do not apply to foreign exchange students who are enrolled in their home country and who come to Denmark to study for just one or two semesters. Danish law states that individuals over the age of 30 must pay for their unemployment insurance fund membership. Therefore, you cannot be a free student member if you are over 30 years old. You can, however, save money on your monthly membership fee, if you follow the advice in the next section. You cannot be a free student member if you are over 30 years old. Instead, you can join an unemployment insurance fund as a part-time insured member. Every person that joins an unemployment insurance fund in Denmark must decide whether he or she wishes to become a part- or full-time insured member. There are significant differences between the two types of membership, one of which is the price. Part-time insurance is cheaper than full-time insurance. Selecting part-time insurance can, therefore, save money on your monthly membership fee. When you finish your education, you must change your membership status from student to new graduate. All student members must do this within 14 days of their last exam. As you do this, remember to also change your membership from part-time to full-time insured member. This enables you to receive the full unemployment benefit rate for new graduates in case you are unemployed when you graduate. If you finish your education without having found a job, you can receive unemployment benefits from your unemployment insurance fund. The normal rules, which apply to wage earners, state that to receive unemployment benefits, you must have worked for at least 12 months with a minimum income of 233.376 kroner (DKK). The rules are different for new graduates, as you do not have to comply with these regulations. You can receive unemployment benefits from the first day of your graduation, if you signed up for membership at least 12 months before graduating. In order to receive unemployment benefits from the first day of your graduation, you must register a profile on www.jobnet.dk the day after you complete your education. You can read more about this requirement in the How to receive unemployment benefits section below. Students that have signed up for membership later than 12 months before graduation must wait until 30 days after their last exam before they can receive unemployment benefits. This is known as the quarantine period. In this period, you cannot receive unemployment benefits. It is worth noting that you do not have to join an unemployment insurance fund at least 12 months before graduation in order to be entitled to unemployment benefits. This is only to avoid the quarantine period. In fact, you can wait until 14 days AFTER your last exam before you sign up for membership. This is the last day on which you can join an unemployment insurance fund and still be entitled to unemployment benefits as a new graduate. If you do not meet the 14-day deadline, you will lose your right to receive unemployment benefits as a new graduate, and you will need to fulfil the normal requirements for receiving unemployment benefits. Among other things, this means that you must work for at least 12 months and register a gross income of at least 233.376 kroner (DKK). Once you have finished your education and joined an unemployment insurance fund as a new graduate, you must take a number of steps before you can claim unemployment benefits. First, you must register a profile on www.jobnet.dk and list yourself as unemployed. You must have a NemID to do this. If you want to receive unemployment benefits from your first day as a new graduate, you must create your profile the day after your last exam. You cannot receive unemployment benefits before you have created your profile. Your unemployment benefits will be transferred to your “NemKonto” bank account on the last workday of every month. Unemployment benefits in Denmark are postpaid. This is important to remember, as the state educational grant, for instance, is prepaid. At the beginning of each year, the Danish state regulates all unemployment benefit rates. There are two types of unemployment benefit rate for new graduates, one for providers and one for non-providers. You are a provider if you have biological or adopted children, but you are not a provider if you only have stepchildren. It is not a requirement that you live with your child. Your child must, however, be resident in Denmark or another country in the EU/EEA. If you are the citizen of a country outside of the EU/EEA, and you want to study in Denmark, then you must apply for a residence and work permit as a student. You can read everything you need to know about this permit at: www.nyidanmark.dk/You-want-to-apply/Study. One of the regulations governing residence and work permits for students states that you must be able to support yourself while staying in Denmark. This means that you are not allowed to receive the State Educational Grant, unemployment benefits or any other public benefits during your stay. This applies to both the period during which you are studying and the six-month job-seeking period to which you are entitled after your graduation. As a student, this rule also applies to any family members you have brought with you to Denmark on your residence and work permit. If you do not comply with this regulation, your permit can be revoked, and you may lose your right to stay and study in Denmark. Even though you are not allowed to receive unemployment benefits while you are studying in Denmark, you can still become a member of an unemployment insurance fund. This might seem contradictory, because the main reason for joining an unemployment insurance fund is to qualify for unemployment benefits. However, if you become a free member, you can take advantage of some of the other benefits of joining an unemployment insurance fund. In Denmark, you can get free membership of an unemployment insurance fund if you are under 30 years old and studying on a higher education course. You can read more about this in the section on free membership in this guide: Free student membership of an unemployment insurance fund. One of the main advantages of joining an unemployment fund is that you can get valuable help to find your next job, whether this will be a student job or a full-time job after graduation. Unemployment insurance funds have many insights into the Danish job market, and they will be happy to help you find your next career, as this is one of their main roles. Unemployment insurance funds also offer workshops, courses, lectures and many other events. For this reason, it is usually helpful to choose an unemployment insurance fund that specialises in the same field as your intended career. This section is not meant to advocate the pursuit of unemployment benefits in Denmark. 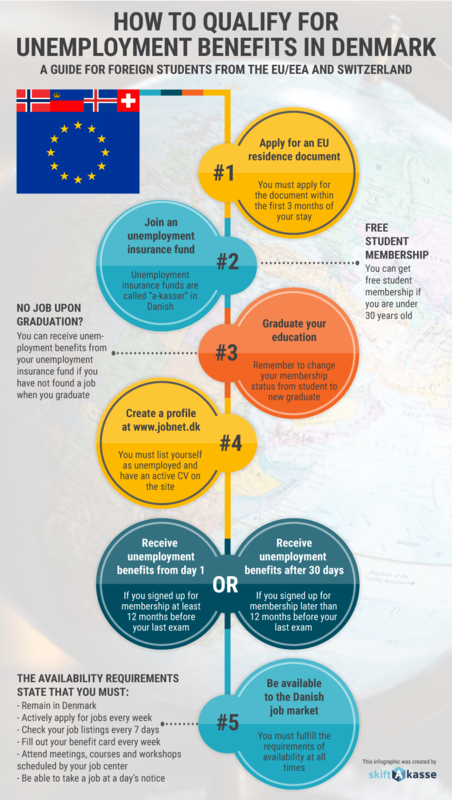 It is meant to be a chronological presentation of the steps a foreign student from a country outside of the EU/EEA must take before they can receive unemployment benefits in Denmark. It should help such students to understand the Danish unemployment insurance system in general. As explained in previous sections, as a student, you must be able to provide for yourself while you are staying in Denmark on a residence and work permit. This means that you cannot receive unemployment benefits. After you have finished your education, this permit will allow you to stay in Denmark for six months while you search for a job. If you succeed in getting a job during this period, you must apply for a new residence and work permit. If your new application for a residence and a work permit is granted, you will have the same rights to unemployment benefits as a Danish citizen. This means you can earn your entitlement to unemployment benefits in the usual manner as a wage-earner. At the time of writing, the United Kingdom is still a member of the EU. Therefore, the rules described in this guide are valid for students from the United Kingdom. This section will explain the rules and requirements that will come into force once the United Kingdom leaves the EU. In 2019, the Danish parliament will add a new residence requirement to the unemployment insurance system. The new residence requirement states that in order to be entitled to unemployment benefits, you must have been a resident of Denmark, another EU/EEA country or Switzerland for at least seven out of the last eight years. There will be a transformation period lasting until 2021. In 2019, you must have resided in Denmark, EU/EEA or Switzerland for five out of the last eight years. In 2020, it will be six out of the last eight years. In 2021, the requirement will be fully implemented, and you must have resided in Denmark, EU/EEA or Switzerland for seven out of the last eight years. There are some situations in which you will be exempted from this requirement. For example, if you are studying abroad or stationed abroad as an employee of a Danish company or authority. It should be noted that the requirement has not yet been put into law, and, as such, some technicalities may change.